While all eyes were on the two leaders of the Koreas for the historic summit held at the border village of Panmunjeom on Friday, North Korean leader Kim Jong-un’s taste for finer things has also grabbed attention. 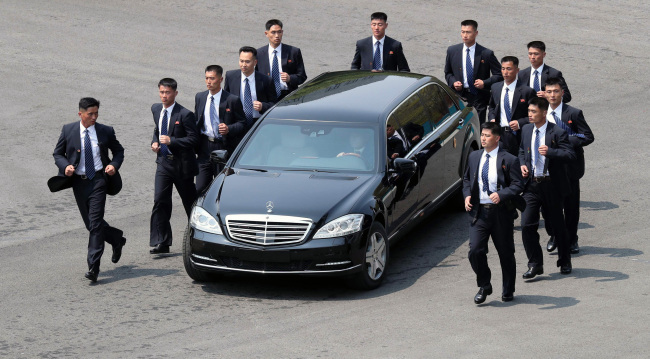 Although it was not aired how Kim travelled 210 kilometers from the capital city of Pyongyang to the truce village of Panmunjeom for the summit, Kim returned to the North for lunch in one of his all-black armored Mercedes-Benz S600 Pullman Guard luxury limousine. Coincidentally, South Korean President Moon Jae-in also appeared on Friday in his S600 Pullman Guard limo, the same model Kim has. Moon is reported to be using the same vehicle which the 17th President Lee Myung-bak had used during his presidency in 2008 to 2013. The 15th President Kim Dae-jung also used the same model for the presidential state car. The 16th President Roh Moo-hyun used BMW 760Li High Security, while the 18th President Park Geun-hye used Hyundai EQUUS Stretch Edition. Reportedly, Kim Jong-un is a car maniac who owns a collection of supercars that is believed to be worth $20 million and counting. Foreign reports say that he has almost 100 cars in his multiple garages, after starting to collect them at a very young age. On April 15 last year, Kim was seen attending a parade in Mercedes-Benz’s flagship S600 Pullman Guard limo in Pyongyang. Kim used the same car when he visited Beijing for a summit to meet Xi Jinping of China in March. Kim’s 1 billion-won ($930,000) worth limo is a specially renovated model with a 6.4 meter-long long-body and is made of bullet-proof steel and special aramid fiber that can bound off a bullet from rifle or grenade. Another luxury item that was noticeable during Friday’s historic summit was Kim Jong-un’s Montblanc fountain pen. 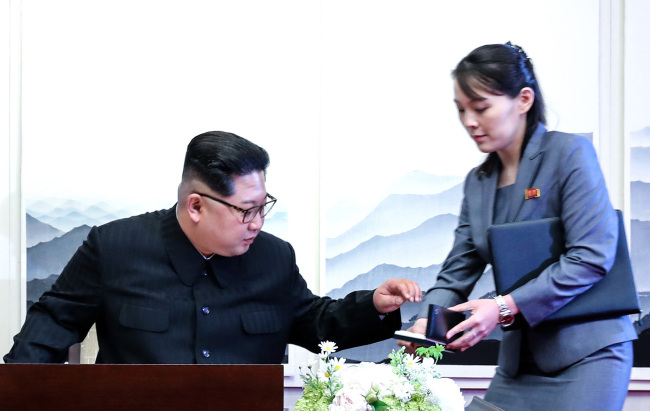 Ahead of the talks, Kim wrote a message in the visitors‘ book as he entered the Peace House, using his Montblanc fountain pen, prepared by his sister Kim Yo-jong. German luxury powerhouse Montblanc’s iconic fountain pen has a history that dates back to end of 19th century. While Montblanc offers a wide range of both standard and limited edition pens, its price range hovers around 10 million won for high-quality models. According to Montblanc’s official website, the cheapest fountain pen is priced at $560. Others said he may favor European brand, since he was educated in Switzerland during his early years.